Malik is part of a carjacking cartel. One day he spots a pretty young woman driving a slick new jeep. She leaves the car and enters a grocery store at which time Malik jacks the vehicle and takes it back to his boss’ base only to discover on opening the back doors that there is a baby boy lying on the back seat. After the initial panic subsides it is decided by the cartel that the baby will be returned to the mother, but first they need to enquire as to where the mother lives. Rita is distraught at being separated from her son and thinks constantly only of where he is and how he is. In the meantime Malik becomes protective over and attached to the baby boy. Fate is to keep mother and son apart for longer than the gang reckoned as when Malik goes to return the child the area is teeming with police and so they abandon the mission with the intent of returning the boy another day. That day never comes as the baby dies in Malik’s hands despite his best efforts to keep him alive. “Don’t make me cry. I want to talk.” Um what did you really expect? “Hello is that 999. I need you to arrest me.” I didn’t know that Nigeria use 999. Do they? The dead baby scene is ridiculous. The baby is supposedly wrapped in cloth but the lump that they come up with is not even baby shaped! Why did they not just wrap a doll up if a real baby could not be used? There are not even tears coming out of Issae’s eyes and the guy is just there yarning rubbish. This lace front syndrome is hitting Nollywood hard and I for one am not loving it at all. Love Rita bad but do not love all the baby hair all in the edges of the lacefront all long, wispy and flyaway. It really does not look good and as far as I’m concerned if you are over the age of 5 or your name ain’t Chilli from TLC then there is no need for all the baby hairs. I just hope this lacefront obsession is fleeting. At the end of part 1 Tchidi does the epilogue thing like he did in Friends in Love (Used People) and Beautiful Soul. This is despite there being a part 2. What is up with that? It looks kinda shoddy. He then had another epilogue at the end of part 2. Is it that it was going to be one part and he changes his mind? If anybody knows why holla! 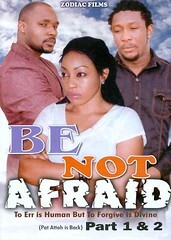 I loved the story but Tchidi is getting above himself casting himself as the lead role. With Ali, Tchidi and Pat replaced this movie could have been soooo much better. That in itself knocked off a good few percentage points. When will he realise that acting is not his forte? I suggest that he goes to rendezvous with his pal Van in New York and hit up those acting classes and just maybe then after extensive training we will be able to say good things. This is a must if he insists on continuing to be in front of the camera. Ali Nuhu too I wasn’t really feeling. He was badly cast in the role of an auto theft cartel Kingpin. In my opinion he came across too young and too soft for the role. How would hardened career criminals listen to a soft boy like that? His character didn’t have enough balls and even when Ali was trying to act “hard” it was laughable and not convincing. This guy is not ready for challenging roles. Pat Attah is back. Still stiff, still wooden, and still easy on the eye but with considerably less hair than when we last saw him. Rita was the standout performance in this. The church scene in particular sticks out in my mind. You could see her being physically drained by the emotions that she was playing out in asking god to provide a crutch for her to carry her through her grief. She wailed, she cried, she made sobbing guttural noises and in doing so she made you believe that she was Issae the young mother shoes son had just been snatched away from her. I would recommend the movie. Overall it was a good watch. Watch if only for Rita’s performance which was excellent. The story was original and did not falter. There was a good message in it all and summed up by Rita’s character Issae at the end of the movie when she says, “everyone has a story,” which is to say that what is surface can be deceptive. People should be judged on an individual basis because despite what anyone has done you do not know the story behind it and indeed everyone has a story. The whole thing was just ruined a little by bad casting and some corny dialogue. Nice to see this review. The original story got me thumping the air and kudos to Rita for carrying it off. Tchidi should stick to directing please. Wellcome back Nolly, good review as always. I will go ahead and see the movie, surely give you a feedback. You this girl eh? You are always coming back with feedback… Casper the ghost… see these disappearing acts! Myne… I will second that last statement of yours! LOL Maybe it was this one Nelly! I have never watched a film with Ali in it where he was suited to the role. Perhaps I have not yet come across the right film. No I have never claimed to be a better critic than anyone. This is my opinion and he can win as many awards as he likes (That is great. He must be very proud of his achievements) but my opinion stands, other people's eyes and ears may tell a different story and they are entitled to their opinions, as too am I. Thank you Amra… When you've watched be sure to come back and share! tchidi copied a vital part of this movie from the ACADEMY AWARD WINNING MOVIE, TSOTSI (south africa). in the film a thief steals a car and finds out a baby is inside the car and he tries to look after the baby. my problem with tchidi chikere exactly is that most times he copies some of his films, it's as if he has run out of ideas. it was an ok film but i tried to watch it on a virgin atlantic flight and his acting is horrendous, but rita was great in it. i didn't like the film because it was too long and dragging too much. it shud have ended in part 1, no need for part 2. My bigger question to all our african brothers and sisters esp those that point a finger at some ambitious and creative person….and go off calling them copycats etc. Well..i read on hoping to find some alternative suggestions on what other themes he could pursue.If you got nothing better to contribute then accept what you get…i always believe its better to have something local on the table esp local rather something foreign…geez!There is pride in anything done or redone by countryman..where is your patriotism friend! They say there is nothing new under the sun so it is inevitable storylines will get recycled no matter the industry. I think the problem comes when movies are exact copy cats. I have not seen Tsoti so I cannot comment on this particular example. I don't believe this is a copied story. Tchidi is not known for such. If there is a man stealing a baby out of a car in both films it does not mean one copied another. There are only so many situations in this world. A lot of thanks for your own hard work on this web site. Ellie enjoys doing investigation and it’s easy to see why. Most of us learn all about the lively ways you offer sensible tips and hints on this website and invigorate response from the others on this subject matter so our own girl has been studying a lot of things. Take advantage of the remaining portion of the new year. Your carrying out a remarkable job.